The month of water in Quebec promises to be rich in activities of all kinds related to water. Participate in large numbers to preserve this essential resource. DATE CHANGÉE AU DIMANCHE 21 AVRIL 2019 EN RAISON DE PLUIE!!!! Le Conseil des bassins versants de la région de Vaudreuil-Soulanges (COBAVER-VS) vous invite à la cinquième édition de son évènement annuel, la « Descente en canoë-kayak de la rivière Beaudette » qui se tiendra le samedi 20 avril 2019. Rappelons que les années dernières, ce sont 140 personnes en moyenne qui ont pagayé la rivière lors des éditions précédentes. Le COBAVER-VS travaille à ce que cet évènement devienne une tradition annuelle pour la région de Vaudreuil-Soulanges. INSCRIVEZ-VOUS EN LIGNE! Get the latest news, information, analyses, updates... and much more! The COBAVER-VS is proud to present our interactive map. It is a new user-friendly tool to quantities of information: location of COBAVER-VS, activities/projects, land use, location of waterways, floodplains, conservation areas, and much more! The Watershed Council of the Vaudreuil-Soulanges region (COBAVER-VS) invites you to the fourth edition of its annual event, the “Canoe & Kayak Descent of the Beaudette River” to be held Saturday, April 21, 2018. Recall than last years, in the spring of 2016 and 2017, 130 and 142 people respectively paddled the river during the second and third editions. The COBAVER-VS is working to make this event an annual tradition for the Vaudreuil-Soulanges region. It should be noted that the event is perfectly in line with the COBAVER-VS mission of implementing integrated watershed management. One of the main objectives of the Water Master Plan (BDP) is to restore water access to the population. This activity will both make participants aware of the potential of using rivers, while giving you an extraordinary experience. 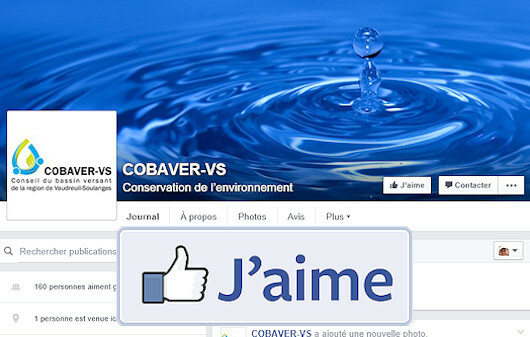 In addition to the Caisse Desjardins de Vaudreuil-Soulanges, the COBAVER-VS would like to thank the partners of the 2nd and 3rd editions, including the municipality of Rivière-Beaudette, the Society for the Conservation and Development of the Châteauguay River Basin (SCABRIC), The Abbey Inn, the Cedars Rapids Electric Transmission Limited, and the Quebec Canoe and Kayak Federation (FQCK). The 4- km course begins in Glen Nevis, Ontario and ends in the village core of Rivière-Beaudette. You must know that the Beaudette River is an excellent watercourse to learn paddle sports (canoe and kayak), because its slope is low and its rapids are very easy level. The activity of April 21 is for people 12 years and older, beginners or experts. The COBAVER-VS will also offer low-cost rentals ($ 20) for canoes and kayaks in limited numbers (participants are encouraged to bring their own boats). Registration costs $ 10, includes a snack at the end of the course and a shuttle bus to return to vehicles. Interested parties are invited to register by April 17 at www.cobaver-vs.org. For more information, you can contact COBAVER-VS by email at dg@cobaver-vs.org or by phone at 450-451-0755. Csur la TV and COBAVER-VS launched the mini-documentary “A river spoke to me, La Beaudette”. 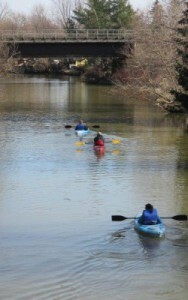 Filming was produced during the 1st and 2nd editions of the Beaudette River canoeing and showcasing its participants. You can watch the trailer at: https://youtu.be/4vgIq29lau8 and have a taste of the adventure that awaits you during the annual event. COBAVER-VS is an integrated watershed management council tasked with regional consultation, planning and coordination. As a regional roundtable, we bring together and collaborate with municipalities, different levels of government, citizens, farmers, industries, communities and environmental groups to ensure sustainability of water resources. Our mandate is to assess the state of watersheds and to determine priority actions needed to optimize integrated water resources management. COBAVER-VS is a non-profit organization (NPO) incorporated under the Companies Act. Copyright © 2019 Cobaver-VS Tous droits réservés.